Imagine you have two fans facing each other. One is plugged in and set to HIGH. The other is unplugged. You’ll notice that the blades of the unplugged fan are moving as though it were on. The wind from the opposite fan is essentially powering it. You can grab a blade of the unplugged fan and it will stop spinning, but when you let go it will start again. This is essentially what happens in a torque converter, but instead of wind, it’s transmission fluid that powers it. Check out this simple guide to understand how a torque converter works in your industrial vehicle. A torque converter allows the engine to spin somewhat independently of the transmission. If the engine is turning slowly, such as when the industrial vehicle is idling at a stoplight, the amount of torque passing through the converter is very small, so keeping the vehicle still only requires a little pressure on the brake pedal. If you were to step on the gas pedal while the vehicle was stopped, you would have to press harder on the brake to keep it still. This is because when you step on the gas, the engine speeds up and pumps more fluid into the torque converter, causing more torque to be transmitted to the wheels. Pro Tip: The wear on an industrial vehicle is vastly different than that of a car and requires far more maintenance and rebuilds. Pump: A centrifugal pump located in the converter housing on the side of the engine. Propels transmission fluid out to the turbine. Turbine: Blades that cause the transmission to spin, which basically moves the wheels of your car. Stator: Redirects the fluid returning from the turbine before it hits the pump again. 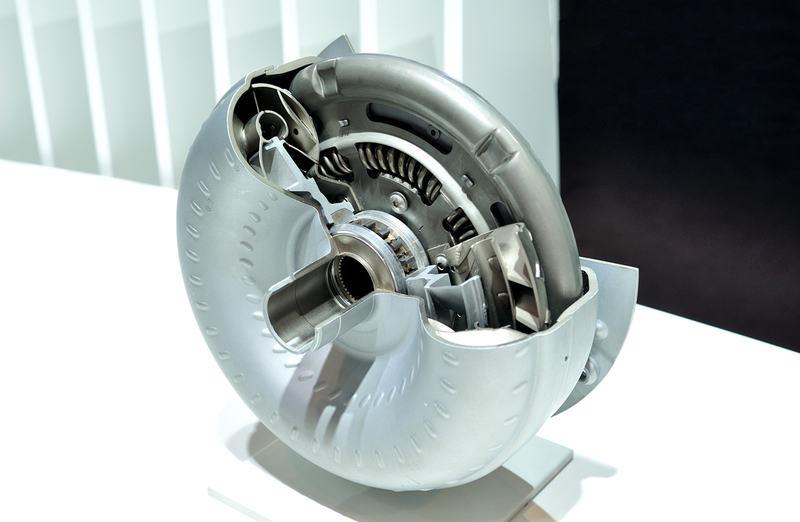 Industrial torque converters differ significantly from those in an ordinary car. They’re highly specialized and designed for specific industrial applications. Whereas your car’s torque converter uses non-industrial rated parts and is built for a lighter duty, an industrial converter is made to withstand 15 hour days in an underground mining drill. An industrial application is quite different and requires far more maintenance and rebuilds. Contact Us to learn more about our rebuilt transmissions or to browse our selection of Allison transmission parts.